CD comes in an illustrated black and white 6-tray digipack featuring extensive text and detailed information, limited 250 copies ! Info:Old Captain is glad to celebrate WERTHAM’s 20th anniversary by releasing “Tell Me The Truth”, a collection of old releases and difficult-to-find tracks from the Italian Power Electronics project that made quite a name for itself thanks to a full-frontal approach that mixes multiple-layered sound structures with aggressive vocals, intense use of samples and uniquely-structured concepts. 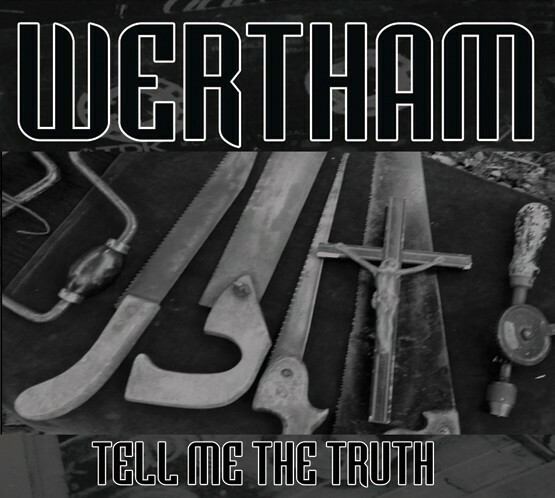 “Tell me the truth” focuses mostly on the first decade of WERTHAM’s recordings, including sold-out tapes, 7”s, contribution to splits, rare tracks from compilations, excerpt from early works and one unreleased song, for approximately one hour of sheer violence, rough sounds and uncompromising attitude, remastered by Monsieur Yvan Battaglia (LCHM). Gender wars, leatherboys, STDs, general socio-biology, frustrations of the modern 9-5 man, Insubria white trash mentality, stereotypes, nutritional disorders, self deprecation, glorification of decaying icons of a withering world are the main themes expressed mostly with minimal slogans. - https://www.youtube.com/watch?v=2LkwHZD5wE4 Status: Only 2. copies! Customer evaluation for "Wertham - Tell Me The Truth CD (im250)"